Otherjones.com: High-Level French Delegation to Crimea signals "The Power of Impossible Ideas"
High-Level French Delegation to Crimea signals "The Power of Impossible Ideas"
Right now, a delegation of French politicians and entrepreneurs is visiting the Crimea, to ascertain for themselves whether the referendum that brought the peninsula back to Russia was backed by guns or was a legitimate expression of the will of its people. The visit comes as failing French dairy farmers stop tourist traffic to Mont St Michel and parliament responds by voting massive subsidies. The unprecedented initiative illustrates Europe’s growing resentment of Washington-ordered commercial sanctions against Russia, which has retaliated in kind, and could be likened to citizen diplomacy, since it happened in defiance of the French Foreign Ministry. 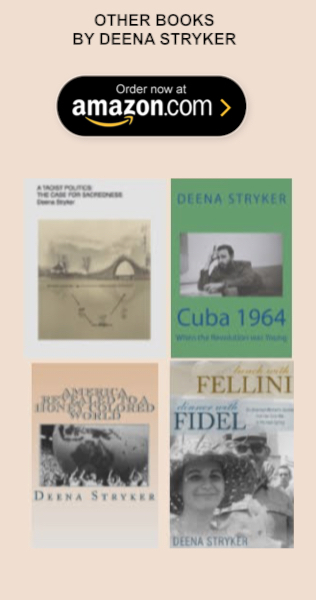 In a book published in 2012, http://www.amazon.com/s/ref=nb_sb_noss?url=search-alias%3Dstripbooks&field-keywords=Sharon+Tennison a mother of four from California documents the birth of an idea - citizen diplomacy - and its achievements over thirty years. Sharon Tennison has succeeded in melding documented milestones, illustrated by black and white photographs, with narratives worthy of a book of fiction. At a time when the threat of nuclear war between the US and Russia that first motivated her in the 1970s is again looming, her achievement is worthy of attention - and emulation. When the US government asked hospitals to set aside beds for victims of a nuclear attack, Sharon was asked by Physicians for a Sane Nuclear Policy to speak to groups about the insanity of nuclear war. After writing to President Reagan, she was informed she had been ‘handed over to the State Department’, and when she and a group of friends visited the Soviet Consulate in San Francisco to request travel visas in 1983, the FBI tried to dissuade her from taking ordinary citizens to visit the Empire of Evil. Since those early days, Sharon has taken about 2000 Americans to visit the USSR/Russia, and about 7000 Russians and other nationalities to the US for training in business and other fields, 6000 in business management training. Under Gorbachev, the Center for Citizen Initiatives (CCI) brought both AA and Rotary to the Soviet Union. The trips to Russia focus on bringing ordinary people together to talk about their lives, based on shared professional or personal interests. Anti-Russian propaganda suggests that the US media maintains Americans in a view of Russia that no longer corresponds to reality, painting the portrait of a drab and bureaucratic country. Unlike what went on during the Cold War, when Communist leaders were rarely singled out unless they banged a shoe in the Security Council. With US encouragement, Russia’s first president, Yeltsin, allowed the pillaging of Russia’s precious resources by oligarchs, yet anti-Putin propaganda is widespread at present, in the face of admittedly high ratings at home, which, it is suggested, simply mean that Russians like authoritarian governments. 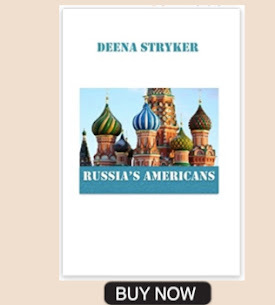 “Our group of 20 citizen diplomats was composed of several travelers who had NEVER been to Russia. For them the trip was a new travelogue with Russian faces, discussions, home visits, and businesses appearing every few hours for the entire trip. I think all would say it was a real eye-opening experience. For others who had been there one or more times, they were shocked at the physical changes in Russia and the Russian people since they last traveled there. Several who have traveled to Russia multiple times over the past dozen years had kept up with Russia's progress, and were fascinated to see into small and large private businesses, think tanks, have frank discussions with many new Russians; even for these watchful observers, Russia is still changing for the better. Last for me, it was intriguing to see how ordinary (and not so ordinary) Russians are faring under the US sanctions and the loss of European trading partners. Of course, depending on whom one talks to, one gets different points of view. The following represents the opinions of the bulk of those Russians with whom I spoke. 1. The most startling fact for me is how well Russian people are withstanding being cut off from their normal long-standing markets and trading partners in Europe––and how they are faring since their ruble lost about half of its value in the past year. They were concerned about how long this period might last, but none registered serious fear or diffuse apprehension. Unlike us, Russians have gone through so much worse in their past. This is apparently rather small by comparison. 2. Next, how healthy and vibrant Russia looks today. Not in my 32 years of traveling around Russia has this country looked so prosperous and orderly. It definitely doesn't look like an isolated country under sanctions. It looks like a healthy, robust place with a great deal of modernity present everywhere. 3. There is a definite pride in Russia's citizenry that I had not seen previously. Today Russians respect themselves and their country, as opposed to the former years when, when to one degree or another, they seemed burdened with insecurities and self-doubt. 4. Russia's structures, from 18th century buildings to today's skyscrapers, are well kept these days. Unlike yesteryear, streets and sidewalks are clean. We traveled by metros, minibuses, and cars inside these cities––and across the countrysides by train and occasionally by cars. Highways are finally in good shape, city streets also, and they are as well marked as ours––this is new. Pedestrians have the right away with traffic now! We saw few dilapidated houses, except for rows of original wooden houses in Volgograd. Russia's villages are disappearing which is a great loss to those who still revere village life. Khrushchev's five-story apartment buildings are being razed with numerous elegant residential buildings going up in each city. I counted 19 cranes from one vantage point in Ekaterinburg. 5. Beauty and Russian classicism "are back" in Russia. Having survived the ugliness of the Soviet period, the bleakness and breakdown of the 1990s, Russian designers and architects have finally come upon classic styles for new building construction and decorating. 6. It seems to me that Russian people have found their comfort zone. They don't aspire to be like Americans or Europeans or anyone else. They feel good about being Russian and belonging to Russia. I think this is due to finally settling into their "national idea" of themselves (a combination of classicism from the Tsarist era including the re-emerging Russian Orthodox faith, built-in social services from the Soviet era, plus a renewed sense of Russia's cutting edge scientists and the Russian nation rising in the world). They have been searching for "what" Russia would become since the 1980s and no doubt even earlier. They appear to have internally settled this issue for the present. 7. Russians are open and honest that they have a long road ahead of them, seeing that there is much to do to refine civic responsibility, law and order, health care, social issues, democratizing issues and to get corruption under control. 8. Russians know they are a major country coming up in the world, yet one gets no sense that they are hungry for power. They aspire to be part of a developing multipolar world, where nations cooperate as opposed to break into competing alliances. I agree, this is the only way that makes sense at this juncture of our world's evolution. Russians are still a modest people, and not given to grandiosity or exceptionalism, in private or in public. 9. Russian people are still questioning what system will be best for them to develop. Is it American Democracy? No. Is it full blown Socialism? No. Is it full Capitalism? No. Is it private sectorism? Yes, definitely. It is some combination of these with plenty of safeguards to support excellent education, culture, the needs of children, the disabled and pensioners, etc. 10. Political system: They seem to still be searching for what's best for Russia …. but are comfortable with their current trajectory at the moment. Putin's approval rate in the Levada independent poll this week is 89%––probably the highest in the world for a head of state. Are there those who dislike Putin, who think he should vacate the presidency and make room for someone younger without a KGB background? Definitely. Frequently they are the younger educated males in the major cities who believe that Putin is the root of all of Russia's challenges in the world. Those with whom I had long discussions have a lot of holes in their perceptions. They are a thin minority but it's good for Russian society for them to exercise other points of view––even if most won't agree with them. 11. Personal freedoms: Most Russians have the main freedoms that they cherish. Remembering communism, they feel great that they can travel abroad at will, be safe in their homes, safe on their streets, choose any kind of work they wish, move wherever they want, educate their children as they please, read whatever they like, have whatever friends they wish, and they are glad to lead a normal life in Russia. There are Russians who push for more freedoms, they too are good for society. However, those who do such acts as desecrating the National Cathedral are not among them. Average Russians don't respect exhibitionism in any form. 12.What would Russians change, if they could? First of all they wish for fewer taxes, less bureaucracy, less corruption and more incentives for private business. They want a more highly organized and efficient society. They want to better understand how to innovate and instigate new levels of Russian production. 13. Russians want to build the great society for themselves and for anyone who comes there to live. They don't tolerate outsiders' ideas of how to build their country. They are frank …. if you come to Russia to live, you are expected to learn the language, live by Russian laws, work and support yourself. You don't go to Russia in order to change it. Russians themselves have the right to change Russia, but foreigners do not. 14. Russians want to help develop a more egalitarian world, one that supports growth and also takes care of societies' less advantaged peoples. 15. Russians and their leadership in the Kremlin and elsewhere have ZERO interest in taking over more land. Nothing would cripple them more quickly than having angry Estonians, Latvians or Ukrainians under their roof. In addition, Russia has more land than they can use. They have more natural resources than they can extract and use/sell over the next 50 years. As far as Crimea goes, they and the Crimeans have understood themselves as the same people for centuries. But for a drunk Khrushchev who gave Crimea to Ukraine without consulting the Crimeans in 1954, Crimea would have been part of Russia up to this day. Rumors that Russia will take any of the Soviet space back into Russia, including Ukraine, are pure fabrications to benefit the objectives of those who are trying to reduce Russia's ability to be competitive in the world.